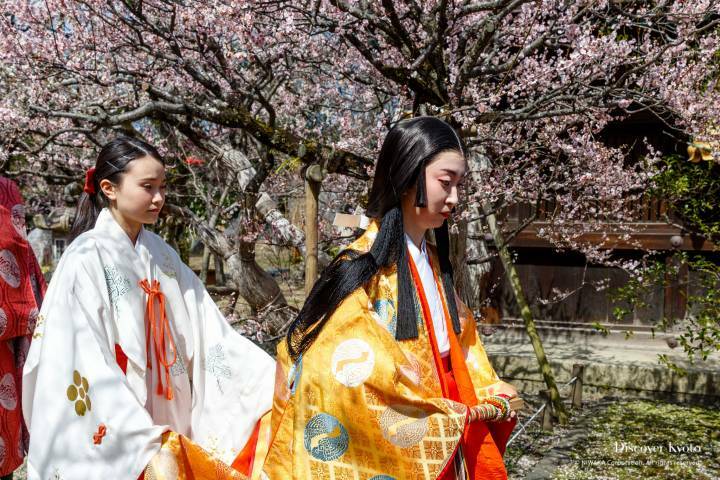 Kitano Tenmangū, a shrine famous for its gorgeous plum grove and prayers for academic success, has recently expanded its ritual calendar with a new festival called Kyokusui no En, which takes place in March and November. Kitano Tenmangū enshrines Tenjin, the deified kami form of esteemed scholar, poet, and politician Sugawara no Michizane (845 – 903). 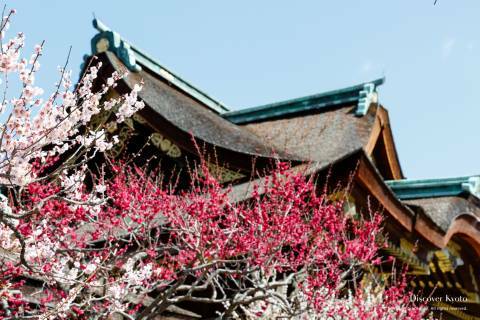 In a practice that started back before Michizane’s day in the 8th century Nara period and lasted nearly 500 years until the end of the Heian period, Japanese nobility often held what were called “winding stream banquets” in which they took to the gardens to leisurely drink, enjoy classic entertainments, and compose poetry. 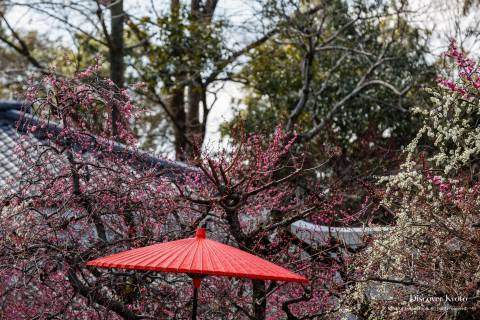 It is said that Michizane himself lent his poetic talents to the banquets hosted by Emperor Uda in 890, which makes Kitano Tenmangū a fitting shrine to add to the growing list of those helping recreate the tradition. 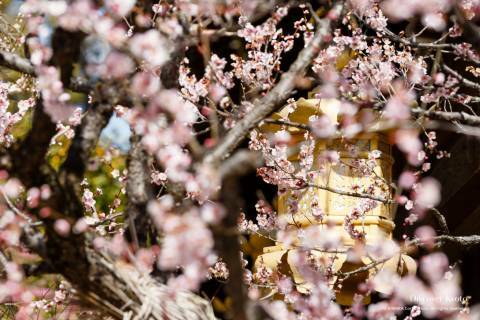 Taking place in the freshly created Funade no Niwa near the shrine’s Kōbai-dono hall, Kyokusui no En starts at 13:00. 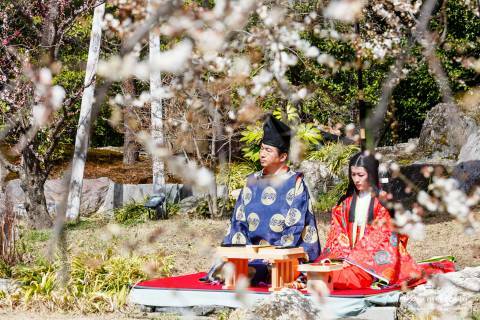 Poets dressed in luxurious Heian period-style robes take seats with writing desks beside a small garden stream, and then everyone present can enjoy a shirabyōshi dance performed to sung poetry, exactly like traditional Japanese nobility back in the day. Once the entertainment ends, the poets, who have each been assigned a theme, begin to compose their verses while young boys ferry small duck-shaped boats carrying sake cups along the stream to provide drinks. In honor of Sugawara no Michizane, who composed kanshi poetry in traditional Chinese style, the participants write both kanshi and the traditional Japanese poetry form of waka. For those who speak Japanese, the event hosts read out the poems once they have been finished, providing explanations of the subtler meanings and historic references behind the poetic language. Even for those who do not speak the language, Kyokusui no En remains a visually stunning recreation of a classic Japanese scene. Kyokusui no En tickets can be purchased in advance via Kitano Tenmangū’s website (Japanese only), or on the day near the shrine gates for ¥1,000.